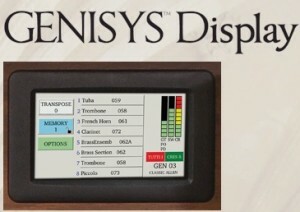 Allen Organ has taken another revolutionary leap forward with the implementation of the new Genisys touch screen display. This display replaces the older left-hand Console Controller drawer that had been prevalent on most Allen Organ for decades. It places control of all of the organ’s computer and Genisys Voice functions literally at the organist’s fingertips! It also replaces the former right-hand MIDI voice/sequencer drawer also found on countless older Allen Organs. These features can now be found within the Genisys display menu! Also included, as seen in the picture below, are the volume/expression indicators that were previously on their own display window on the console. As mentioned above, Allen has also introduced the new Genisys voice system. Unlike the earlier MIDI products requiring a separate console/control drawer, the new Genisys system is located on the new Genisys Display. Voices are activated using Genisys-labeled tabs and drawknobs. This follows the previous concept used by older Allen Organs utilizing the card reader/Alterable Stop system. Unlike that system however, the Genisys system retains all settings made by the organist after turn off. And unlike all other previous systems offered by Allen, the new Genisys system allows for full coupling capabilities between divisions! This allows the organist to increase the overall range of the organ like never before! Please visit the link below to learn even more about this system. 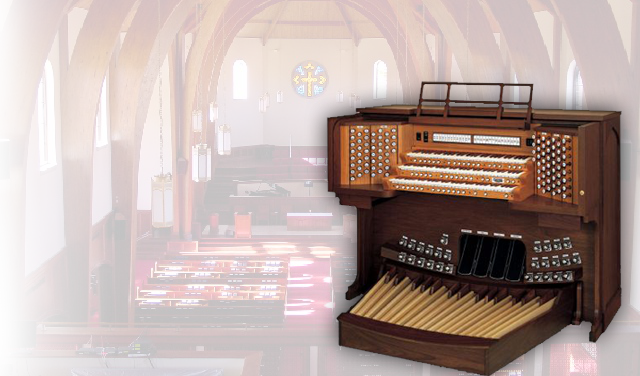 And contact Allen Organ Studios of Atlanta to discuss how you can own one of these new organs!